Allison Cafe » Catalina Dreaming. A 4 Hour Tour to Beautiful Catalina Island. Catalina Dreaming. A 4 Hour Tour to Beautiful Catalina Island. My parents recently bid on a package at a local charity event for a day trip to Catalina Island. 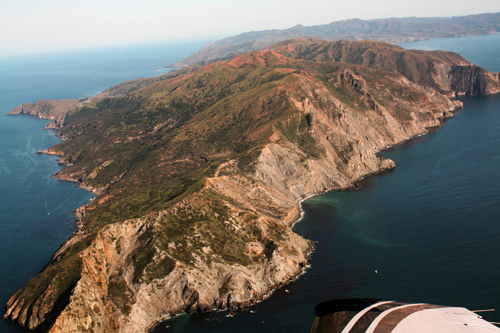 The package was a four hour tour of Catalina island, including round trip air transportation from Air Options Aviation and lunch at the Inn on Mt. Ada for four people. My husband and I were my parents’ lucky guests for the day. Our flight departed from Carlsbad, Palomar Airport. 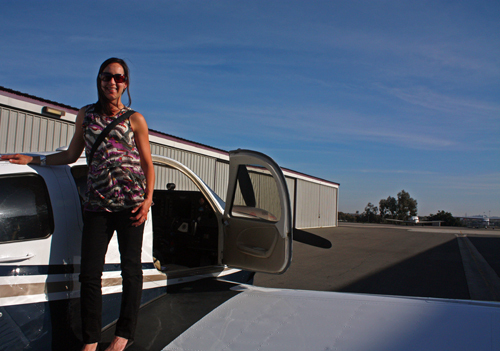 We simply drove up to the private hanger and were whisked aboard the small plane. No tiny 2 oz bottles. No waiting in line. We felt like celebrities. The flight there only took about 30 minutes. The airport on Catalina Island is actually perched on top of a mountain with a bird’s eye view of the island. The view from the flight there and from the airport was amazing. From the turquoise water to the peaceful looking harbors. From the airport we took a local taxi to the city of Avalon, about a 30 to 45 minute journey through the mostly uninhabited island. The island is also home of a variety of wildlife, including buffalo that roam the hills. And our cab driver gave us an unofficial tour and history of the island as well. 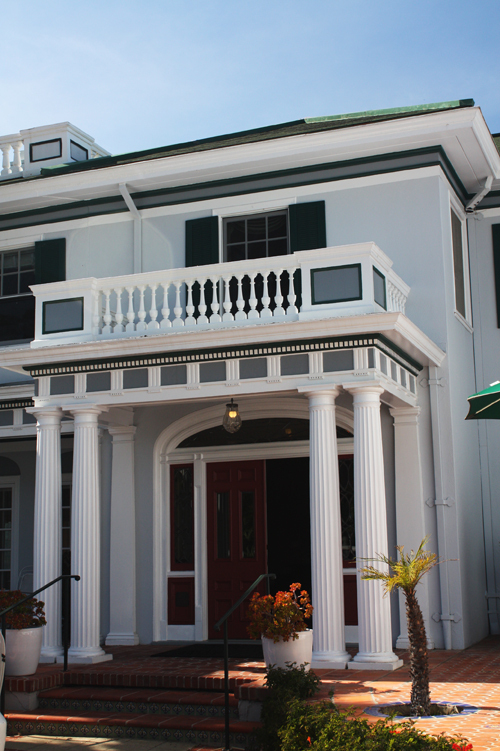 The island was purchased by William Wrigley, Jr. in 1919 and his influence is still seen there today. 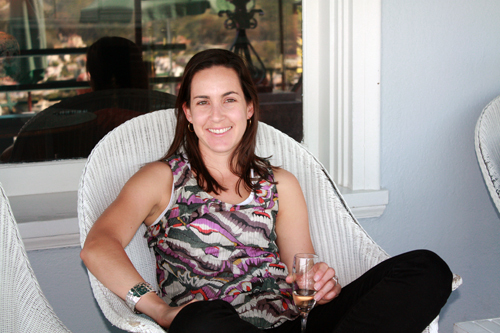 Everything from the areas of the island devoted to education and the preservation of the land to the winery. Our next stop was the Inn on Mt. Ada, the former Wrigley mansion turned inn and business venture. Mt. Ada was named after Mr. Wrigley’s wife. And they chose the location for their home because of it’s wonderful sunrise and sunset views. 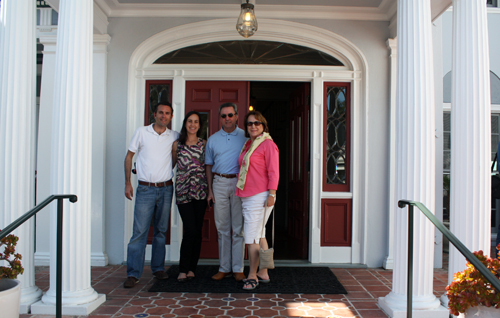 From the moment we set foot into the lobby of the inn we felt right at home. It was so amazingly peaceful and serene. And it didn’t hurt that they had champagne waiting for us! We enjoyed a scenic lunch on the patio and took in the breathtaking views of the mainland and the harbor of Avalon. If not for the scheduled return flight I think we would have stayed for days! We hopped back in the taxi and journeyed back to the airport. 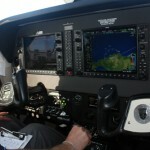 Our pilot and guide, Joshua, gave us an aerial tour of the island as we left and I even got to sit in the co-pilot seat. That was truly amazing to experience. 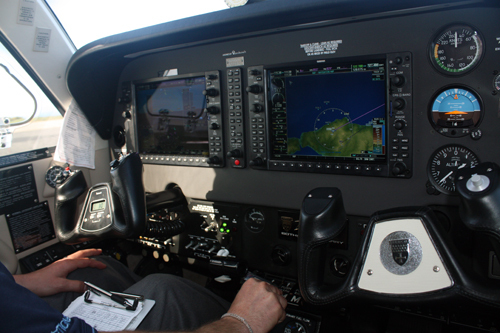 From the technical instruments to the dialogue of the air traffic control tower and the pilots. Not to mention the views. Thank you Mom and Dad for inviting us on your tour of Catalina, it was something I’ll never forget. And thank you to Joshua of Air Options Aviation, our taxi driver and the crew at the Inn on Mt. Ada for making our brief visit one to remember. In fact we are feeling very inspired to sail there for the jazz festivals this summer and make it a longer stay next time. We didn’t have to go far at all to feel like we were on vacation. Catalina is definitely on our minds! 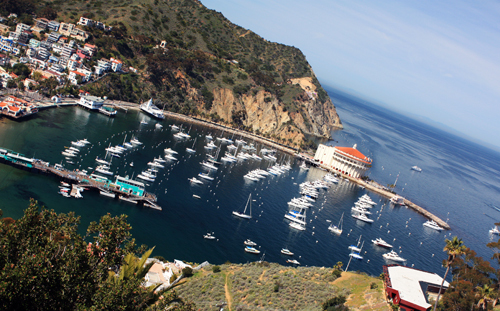 Jetsetting at it’s best…Catalina is an amazing getaway only about 30 miles from the coast of southern california. thanks guys! And Meg- you have to share your Catalina journey! Especially how you liked the boat ride. We hope to sail to Catalina this summer. All images and original content on this site are the sole property of Allison Chirdon Baloglu and may not be used, copied or transmitted without express consent. All other marks are property of their respective owners. We use a Canon SLR Digital Rebel for most hi-res shots and a Nikon CoolPix S6 for point and shoot moments and video.